Online Learning - How can we make it better? Education is a passion of mine, so is learning, and during the recent years, I've been taking different approaches towards learning and teaching online. I've taken online university courses, free courses such as on Khan Academy, EdX, tried to learn to code on a variety of sites such as Codeacademy, Treehouse, Code Babes (Yep, one of the more interesting motivators to crush coding) to name a few. I've had the opportunity to hold live webinars, facilitate team development sessions and teach photoshop tutorials in remote places. They all have their nooks and crannies, but I've reacted to a few things. Out of the four universities I've attended, the distance courses that worked well was learning a language and one on photography. Neither of these two had much in common except a decent UI, they were neither universities prominent in the field of teaching or IT. One of the other two did though, one I lost all my motivation because they expected every participant to be able to buy books that could only be bought in Sweden, even being in the neighbouring country of Denmark made that one difficult for me. Sadly, the participants located in other parts of the world didn't make it either. So lesson one: Make all your material available in a digital format if you are to create a digital online learning experience. 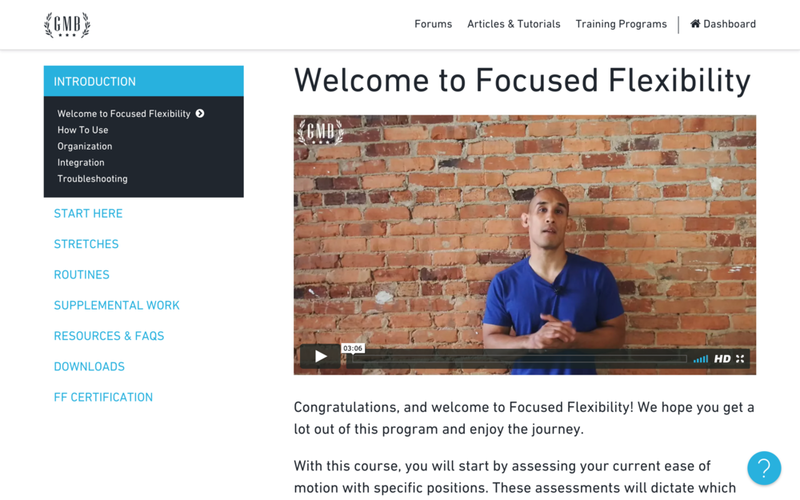 I'm not writing this just to complain, rather praise, and I want to give an example of a great online learning platform in my opinion. Oddly enough it is for learning how to use your body. The website is gmb.io, GMB, short for Gold Medal Bodies empower people all over the world to master their bodies, have fun and reach physical autonomy. Their site might not be prettier than most others but they do apply some great principles to teaching. 1. They act human in everything they do, from videos, how to measure results and practice. Ex. Ryan, the head coach, shows us that even he has bad days when practicing and that it isn't about achieving a perfect movement but rather to play with it. 2. They use "staged" visibility, meaning they don't show you everything or release a whole program. You are working in levels, yet you can't see what's next, enabling you to focus on the now. 3. They teach you how to learn. Ex. They have simple instructions for how & why's and success tips on how to practice. 4. They have extra resources that are relevant and easy to understand. 5. They encourage you to share. Ex. They have Facebook groups where they encourage you to share your attempts during the days which enables participants to interact with each other. They also have what they call the Alpha Posse for more dedicated members to interact, get weekly recaps and learn. These are a few things that I believe are necessary for capturing and making online learning better. Teaching how to learn online with a human approach is so relevant as there's a lot of information lost when teaching through the screen, it might sound like a simple thing, but for most people they need the simplest of instructions to navigate a learning platform when things aren't as intuitive. What practices have caught your attention and helped you learn online lately? 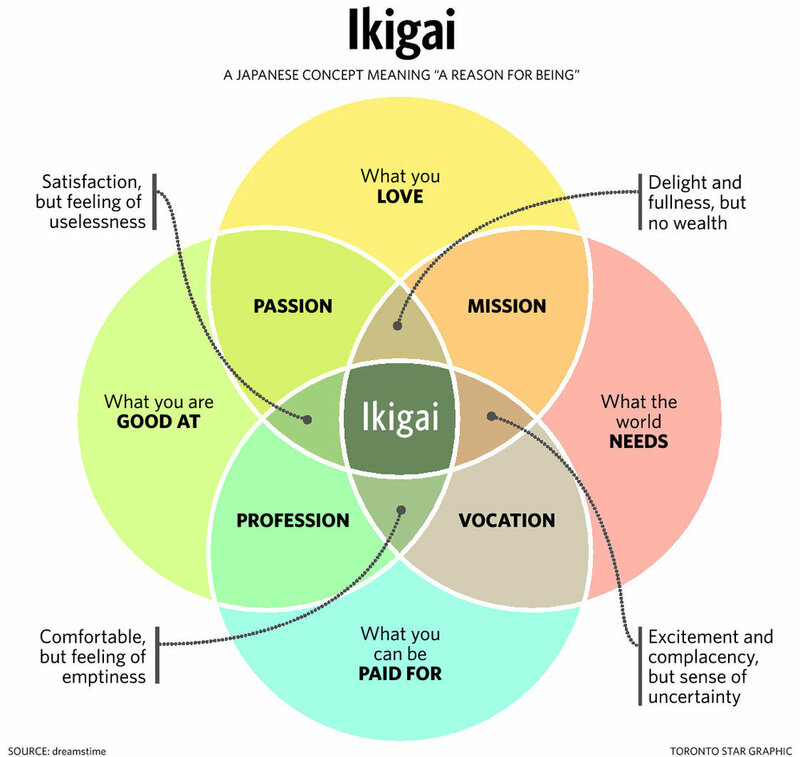 Just recently I stumbled upon the concept of Ikigai, something that felt so familiar yet hadn't been fully visualized for me. In coaching and organizational development, we use words like Mission, Passion, Purpose, and focus on what people feel are good at or feel intrinsically motivated towards. Yet I think we tend to push/lead people in the gray zones of the Ikigai model. Satisfaction, but the feeling of uselessness = when we've optimized a process, and given lots of treats to make the employees happy. Delight and fullness but no wealth = A lot of startups adopting Lean methods without balancing or understanding the rest of the business world. Comfortable, but feeling emptiness = really good at something and only motivated by being the best. Excitement and complacency, but the sense of uncertainty = Lack of proactiveness and self-leadership but filled with a purpose or vision for the company. I find this super exciting to explore, we can, of course, twist perspectives to fit each one of these gray zones, though these are just some of them. I realize that I tend to forget the vocation part of the circle and feel that I really need to explore this zone in my own field. What are you neglecting in your being? Are you taking the time you need to work towards your Ikigai? Signing off for this time. 10 Years on Facebook: The time before FB-Chat, likes and the need to post your status updates in the third person. Kris had terrible spiky teenage hair and had no idea all his wall posts would be kept open for friends. Social Media platforms have become such an everyday habit for us and I don't think we realize the amount of media we consume or create and what impact it has on our mental health, physical health, relationships, and abilities to learn. Don't get me wrong, social medias are amazing and have excelled our abilities to communicate and connect. Though, finding that balance of meaningful relationships with others, our own perspectives of worth and our relationship to information is going in many different directions. I would like to introduce "Social Media Awareness", just like in mindfulness, the psychological process of bringing one's attention to the experiences occurring in the present moment, you do this by becoming aware through either meditation or other forms of practice. I believe the need of Social Media Awareness is needed to be taught, the psychological process of bringing one's attention to the social media experiences occurring externally and internally in the present moment. What kind of implications does it have on me sitting in front of Facebook for around 1/3 of every working hour? How does it affect my social, physiological, emotional, and spiritual well-being when scrolling through those newsfeeds? Is it causing more distance, stress, and anxiety seeing people's happiness, news filled with fear or puppies noses being booped? Or am I connecting with people on a genuine level and creating new opportunities to share the joy with others? It will be exciting to see if any forms of Social Media Awareness arise and if there will be self-help gurus around this soon, maybe there already is, enough banter for today. Well, cheers to another 10 years of social medias! So, you’ve started to grasp parts of what facilitation is about. Now the question stands: How do I become a facilitator? Here’s part of my journey and what I believe helped me gain the experience and confidence to call myself a facilitator. Facilitation was something that came naturally to me as a kid. I always wanted to bring the whole group together & create together, never wanting to make the decisions or make people do things. I never really understood why I should force things. Though not until recent years did I understand that there was a word for what I was doing and that I could actually apply it to businesses & change the people around me. First, I started reaching out to people who called themselves facilitators, talked to people, interviewed, searched for tools and asked for reading material; there are a lot of tool books out there but understanding the mindset and process of facilitation was a bit harder to find. Secondly, I was lucky enough to be in a creative business school who encouraged facilitative leadership. So I decided to make the room and time to develop that skill. First I started by asking to lead team development sessions, wrap ups of projects and shadow our program managers when they would start off projects. I listened and analysed how and why they would use certain tools, questions and looked at things such as timing & their workshop designs. Though the biggest game-changer in my development was to get a mentor. That mentor was Sarah Gregersen, whom I work with today at The Other Potential. She came to our school to teach a 5-day facilitation course and 5 minutes in I knew I had to pick her brain. She not only taught facilitation, she also applied it everyday. I wanted it to be a mutual exchange of time, knowledge and favours and presented it like that. I had no idea of what I could give her but one thing that was apparent was that I wanted to learn. Facilitation isn’t only about being on the floor and by getting to help a mentor I got that experience. I got the experience of doing the nitty-gritty work; some of it I enjoyed, some not as much. But just like eating is a lot of fun, you can start finding joy in the cooking, the prep work and even doing the dishes if you allow yourself to look at it differently, especially if you’re curious. Facilitation is all about the process so look at the process. Look at the bigger systemic process and also look at the process of how facilitators work. I would have never gotten the experience of designing a spreadsheet for a workshop if I hadn’t reached out to do work for my mentor and I would have never gotten the feedback & tips when working the floor. 1. Reach out, read, interview, discuss. 4. Get a mentor, work for them and do all the nitty gritty stuff. 5. Once again, get a mentor. I would like to highlight that facilitation is about transformational leadership and leaders are chosen when the roll & situation asks for it, some days it might be your mother taking charge of the family dinner or that quiet guy in the corner who knows how and where to go to safety in an office fire. One thing facilitation does focus on is growth, setting a learning or creative environment for the participants. With some thought and reflections I believe you can imagine those situations and find where you can grow yourself and apply your art of facilitation. Good luck and if you want to discuss, get tips on material and more then feel free to contact me either on Twitter @kblimling or here. For the past few months I was placed in a so called reverse mentorship. This was a person who was older & had more work experience than me and I was to be their mentor. And did I learn a lot! And so did she! I believe many see mentorships as a romanticised student — master relationship where the student does everything for that master, it’s an odd transaction of time & effort for knowledge. I don’t believe this has to be the case. One of the best things about being a mentor is that you get asked questions that either challenge your knowledge or opens you up to new perspectives. It’s the exact same thing as being the one mentored. In my opinion, there is no better feeling than feeling utterly stupid cause that just shows that there is more to learn, more to explore and more to create. When the student becomes the master and the master becomes the student. I think this is one to keep in mind when going into mentorships. Mentorships are not about a transaction of knowledge or favours; it’s about transformation between the two. Sometimes I will grow from learning, watching, asking my mentors about their experience. At times the tables will be turned. Unfortunately a lot in the west we have been schooled in individual pride of achievements and not seeking the growth of our skills or knowledge. You will get new perspectives on your own field. You get to pick a brain which has deep knowledge in the subject you’re interested in. You will be challenged by that someone. Your sphere of influence will be expanded ex. new book recommendations, conferences, people to reach out to. Your network will grow & you will be introduced to people you never knew existed. There will be new opportunities ex. for growth, work, time, projects. You will most likely have somebody who is just as excited about the work as you are. I want to point out the last one. That feeling and drive means so much when we work together. It’s that shared passion that can really drive through some amazing projects. I would have never jumped up and down of excitement with somebody on biomimicry if I hadn’t approached my mentor with it. So, not sure where to look for a mentor? First off I would like you to think of somebody you look up to in your field. Great, now start looking at people around the same level as that person. Now start looking for people who are just a bit behind you in whatever field you love to pursue. These are all people who can be your mentor or that you can be a mentor to. I know it can be scary to approach somebody about becoming their mentee. Though most say yes to a person showing that kind of excitement towards their subject. And if you get a no, it’s not the end of the world. There are a lot of people out there willing to learn. Remember set some guidelines, approach it with a learning & growing mind and I’ll guarantee you that you both will get a lot out of it. Now go get ’em, connect & grow together! Facilitator & Project Manager — What’s The Difference? Lately I’ve realised the need to clarify the differences between a project manager and a facilitator with clients and individuals who have come to see the potential of bringing in facilitators. Therefore I thought we could take a quick look at the two roles and also introduce a model to have in mind. the person in overall charge of the planning and execution of a particular project. a person or thing that facilitates. a person responsible for leading or coordinating the work of a group, as one who leads a group discussion. Project managers — plan & execute, facilitators — lead & coordinate. I would like to introduce the content-process model which is great to have in mind when thinking about the differences. A project manager will often have the mandate to make decisions on the content. Ex. if a product will be launched or who will execute which task. Facilitators on the other hand don’t have the mandate to make decisions or telling who will be creating or executing. As a facilitator your focus is on leading the process, making the most value for the participants and in no way creating, deciding, or changing the content. Meaning facilitators can be brought in for short term to long term projects. Everything from a 30 minute meeting to a blended learning project which can span a few years. They are often brought into help with planning as process consultants and can give advice on how to plan a process or design a process for a client. Though in the end it is up to the client to decide on what kind of content they want. There are of course many situations which people can switch between the roles. The facilitator role can be adapted by a project manager when needed but I urge to make it explicit which role your in; not only for yourself but also the people you surround yourself with. The outcome will be very different if you are there for the participants process or the desired content. I hope to have been able to bring some clarity to the two and feel free to use the content vs process model as an example when you are facilitating. Signing off for now and do give me a shout if you’re interested in discussing deeper on the subject. A bonus here, a raise there. Or maybe we should use fear instead? The classical carrot vs whip dilemma to either increase efficiency or lower the turnover rates. There are a lot research papers showing that employees are engaged somewhere from 17–35%. I find that a bit scary. Extrinsic motivators such as carrots seems like the good guy way of doing it but it never really pans out in the end. If somebody else is offering a tastier carrot people will go for that one instead. You’ve most likely come in contact with sales-driven companies where there are constant competitions between individuals and teams on who can sell the most or figure out a solution the fastest. Yet I don’t need to state a bunch of statistics to argue that their turnover rates are pretty high. Sure, people get stuff done on short terms but how many get left behind, irritated, hating their job, just for a little bit more money? How many of those go on to having 40 year old crises and totally changing their career path, get totally burnt out or depressed? A good amount. Instead of making sure they get what they want, start asking why or how things drive them. The room for reflection is often the first thing to go in stressful situations and in my opinion it should be held onto the most. We don’t learn from failures without the time to reflect on what happened and if we don’t have the space to talk with others and share our reflections we lose out on all those chances of connecting on a deeper level. The connections that enable us to collaborate. How many times have you been in situations where small petty things became huge over time because somebody didn’t take the time to talk it out? You can’t motivate people; though you can ask the right questions which will make them find their inner motivation. Giving people the space for reflection on intrinsic motivators create meaning which creates participation on a much deeper level. When each person isn’t resisting their own feelings and are able to go to bed thinking: Ah, that felt meaningful today. Then you can actually keep them engaged. Too many of us are scared of letting people think for themselves believing that once they do; they will leave the company or get disengaged from the project, etc. No, quite the contrary; if you create the space for self-leadership, reflection on own motivations for every team you will get a team or company that aren’t a bunch of happy dogs running around for treats but actual people. People who will figure out creative solutions to what ever task they have at hand. People who are driven by their inner monologues and meaning. People who are happy and want to share that happiness. People who are motivated. Ah, we need to get this done fast and much better!!! Why not try slowing down & take your foot off the gas pedal? Start talking about what’s going on, what people are feeling, why they’re feeling like that and don’t forget yourself.